One of the staples in an everyday diet, Kohlrabi are grown in the villagers' gardens. Mostly used in soups, the vegetable also makes for a tasty snack. 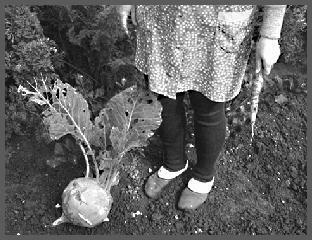 The villagers are very particular about their Kohlrabi. The vegetable's fibrous inside gets hard and tasteless if overripe. In the cities, people buy Kohlrabi at the market.